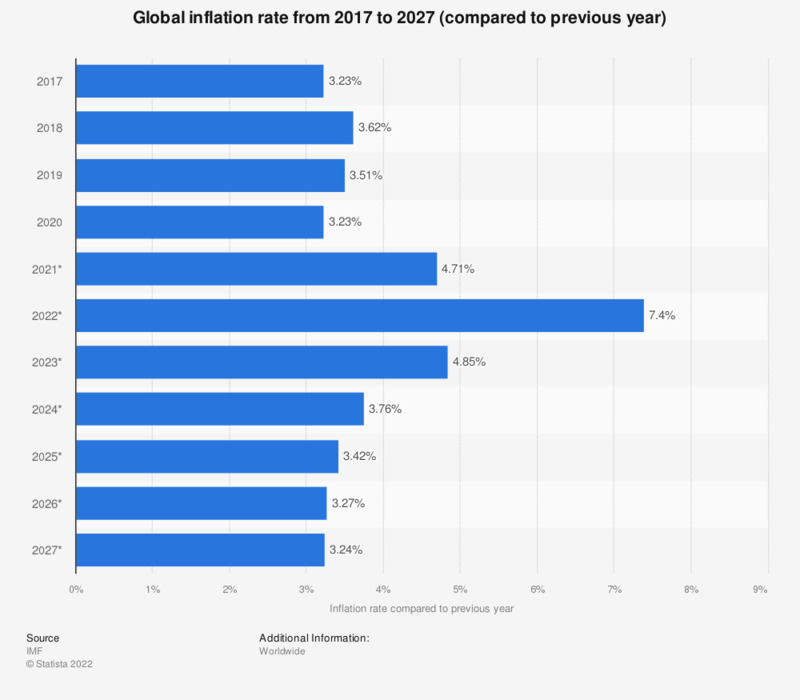 This statistic shows the global inflation rate compared to previous year from 2012 to 2022*. In 2017, the inflation rate worldwide amounted to approximately 3.2 percent compared to the previous year. Inflation is often defined as the continued increase in the general level of prices of goods and services. Global economy has suffered immensely since the global financial crisis in 2008 and that has caused global inflation to increase. The highest recorded global inflation of the past decade in comparison with the previous year took place in 2008, when it increased by more than 6.4 percent in comparison to the global inflation rate in 2007. The global regions with the highest year-on-year inflation rate in 2014 are the Middle East and North Africa, as well as Africa Sub-Sahara. The nations in the world with the highest inflation rates in 2015 were Venezuela and Ukraine. Interestingly, in 2015, the inflation rate in Venezuela was approximately three times as high as the inflation rate in Ukraine. As a result of a global economic downturn, the lack of a sufficient central bank, and the rise in interest rates, the cost of living in the Middle East has also become much higher than in industrialized countries. The inflation rate in industrialized countries in 2015 was just about 0.35 percent. Meanwhile, the inflation rate in the Middle East and North Africa amounted to more than 6.2 percent. Due to economical progress following the global financial crisis, developed countries in the European Union and the euro area set forth economic strategies to strengthen their economy and maintain a stable economy. In addition, stagnant worker wages and a hesitation from banks to easily distribute loans to ordinary citizens have also caused the inflation rate in the euro zone to be relatively low. In 2015, Grenada and Switzerland reported the lowest inflation rates in 2015 in comparison to the previous year.